At Runneymede, England, on June 15, 1215, King John of England signed the Magna Carta (formal copy of the Magna Carta in PDF format) in which he conceded a number of legal rights to his barons and to the people. In order to finance his foreign wars, King John had taxed abusively. His Barons threatened rebellion and coerced the King into committing to rudimentary judicial guarantees such as the freedom of the church, fair taxation, controls over imprisonment (habeas corpus) and the right to all merchants to come and go, freely, except in time of war. The Magna Carta had 61 clauses the most important of which may have been #39: "No freeman shall be captured or imprisoned ... except by lawful judgment of his peers or by the law of the land". It was the first time a king allowed that even he could be compelled to observe a law or the barons were allowed to "distrain and distress him in every possible way", just short of a legal right to rebellion. 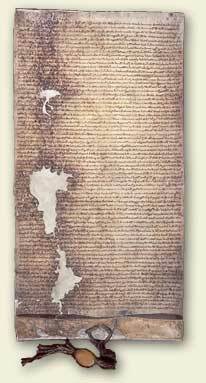 Once sworn to the document, letters were sent to all sheriffs ordering them to read the Magna Carta aloud in public. It was a first "bill of rights" which tried to put some kind of controls over the total powers of monarchs; continuing a worldwide trend away from the arbitrary rule of man to the more predictable rule of law. It has been called the "blueprint of English common law" and was even recently pleaded in a English case. FIRST, THAT WE HAVE GRANTED TO GOD, and by this present charter have confirmed for us and our heirs in perpetuity, that the English Church shall be free, and shall have its rights undiminished, and its liberties unimpaired. That we wish this so to be observed, appears from the fact that of our own free will, before the outbreak of the present dispute between us and our barons, we granted and confirmed by charter the freedom of the Church's elections - a right reckoned to be of the greatest necessity and importance to it - and caused this to be confirmed by Pope Innocent III. This freedom we shall observe ourselves, and desire to be observed in good faith by our heirs in perpetuity. If any earl, baron, or other person that holds lands directly of the Crown, for military service, shall die, and at his death his heir shall be of full age and owe a relief, the heir shall have his inheritance on payment of the ancient scale of relief. That is to say, the heir or heirs of an earl shall pay £100 for the entire earl's barony, the heir or heirs of a knight l00s. at most for the entire knight's fee, and any man that owes less shall pay less, in accordance with the ancient usage of fees. But if the heir of such a person is under age and a ward, when he comes of age he shall have his inheritance without relief or fine. The guardian of the land of an heir who is under age shall take from it only reasonable revenues, customary dues, and feudal services. He shall do this without destruction or damage to men or property. If we have given the guardianship of the land to a sheriff, or to any person answerable to us for the revenues, and he commits destruction or damage, we will exact compensation from him, and the land shall be entrusted to two worthy and prudent men of the same fee, who shall be answerable to us for the revenues, or to the person to whom we have assigned them. If we have given or sold to anyone the guardianship of such land, and he causes destruction or damage, he shall lose the guardianship of it, and it shall be handed over to two worthy and prudent men of the same fee, who shall be similarly answerable to us. For so long as a guardian has guardianship of such land, he shall maintain the houses, parks, fish preserves, ponds, mills and everything else pertaining to it, from the revenues of the land itself. When the heir comes of age, he shall restore the whole land to him, stocked with plough teams and such implements of husbandry as the season demands and the revenues from the land can reasonably bear. Heirs may be given in marriage, but not to someone of lower social standing. Before a marriage takes place, it shall be made known to the heirs next-of-kin. At her husband's death, a widow may have her marriage portion and inheritance at once and without trouble. She shall pay nothing for her dower, marriage portion, or any inheritance that she and her husband held jointly on the day of his death. She may remain in her husbands house for 40 days after his death, and within this period her dower shall be assigned to her. No widow shall be compelled to marry so long as she wishes to remain without a husband. But she must give security that she will not marry without royal consent if she holds her lands of the Crown, or without the consent of whatever other lord she may hold them of. Neither we nor our officials will seize any land or rent in payment of a debt, so long as the debtor has movable goods sufficient to discharge the debt. A debtor's sureties shall not be distrained upon so long as the debtor himself can discharge his debt. If, for lack of means, the debtor is unable to discharge his debt, his sureties shall be answerable for it. If they so desire, they may have the debtors lands and rents until they have received satisfaction for the debt that they paid for him, unless the debtor can show that he has settled his obligations to them. If anyone who has borrowed a sum of money from Jews dies before the debt has been repaid, his heir shall pay no interest on the debt for so long as he remains under age, irrespective of whom he holds his lands. If such a debt falls into the hands of the Crown, it will take nothing except the principal sum specified in the bond. If a man dies owing money to Jews, his wife may have her dower and pay nothing towards the debt from it. If he leaves children that are under age, their needs may also be provided for on a scale appropriate to the size of his holding of lands. The debt is to be paid out of the residue, reserving the service due to his feudal lords. Debts owed to persons other than Jews are to be dealt with similarly. No scutage or aid may be levied in our kingdom without its general consent, unless it is for the ransom of our person, to make our eldest son a knight, and (once) to marry our eldest daughter. For these purposes ouly a reasonable aid may be levied. Aids from the city of London are to be treated similarly. To obtain the general consent of the realm for the assessment of an aid - except in the three cases specified above - or a scutage, we will cause the archbishops, bishops, abbots, earls, and greater barons to be summoned individually by letter. To those who hold lands directly of us we will cause a general summons to be issued, through the sheriffs and other officials, to come together on a fixed day (of which at least forty days notice shall be given) and at a fixed place. In all letters of summons, the cause of the summons will be stated. When a summons has been issued, the business appointed for the day shall go forward in accordance with the resolution of those present, even if not all those who were summoned have appeared. In future we will allow no one to levy an aid from his free men, except to ransom his person, to make his eldest son a knight, and (once) to marry his eldest daughter. For these purposes only a reasonable aid may be levied. No man shall be forced to perform more service for a knights fee, or other free holding of land, than is due from it. Inquests of novel disseisin, mort dancestor, and darrein presentment shall be taken only in their proper county court. We ourselves, or in our absence abroad our chief justice, will send two justices to each county four times a year, and these justices, with four knights of the county elected by the county itself, shall hold the assizes in the county court, on the day and in the place where the court meets.